The PCM23401A is a full-wave rectified SCR drive that is a cost-effective solution for variable speed, process control applications requiring protection from washdown, dirt and other corrosive elements. The PCM23401A accepts 115 and 230VAC for control of 90 or 180VDC, SCR brush-type motors respectively, ranging from 1/8 to 2HP. 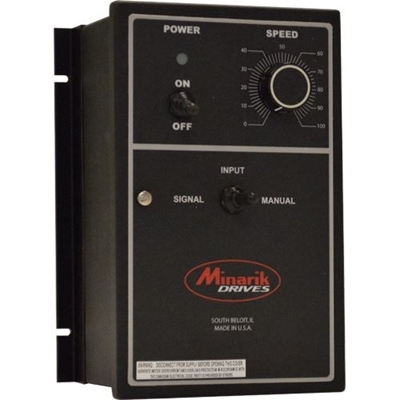 For added versatility, this drive has integrated isolation which allows it to follow analog current or voltage signals from external devices as a reference for motor speed control. Users can operate the drive in three distinct modes. 1) manual mode-normal potentiometer operation, 2) signal mode-accepts an external speed reference voltage or 3) signal with ratioing mode-accepts an external speed reference voltage that can then be scaled by an external potentiometer. The wiring configuration of a quick connector inside the case determines the operation mode. The face of the NEMA 4X enclosure has a power switch and light, manual/signal input switch and external speed potentiometer.